Somewhere along the line, Anthony Bourdain described the Twin Cities as having some of the best Vietnamese food in America. I wonder if he has eaten here enough to know, or if he knew just enough to feed James Norton, the hungry interviewer, a good answer. I can see him cooly ambling into Quang, lanky white guy in a tattered black coat slurping it up with the Vietnamese locals. I’m not exactly an expert in the matter, so I’ll let him form the strong opinions. Last time I went to Jasmine Deli, I awkwardly missed out on the banh mi and I fell for the urban myth of the pho. After I posted my review of the deli, I got an unexpected email from M, a close friend who had lost touch with me. 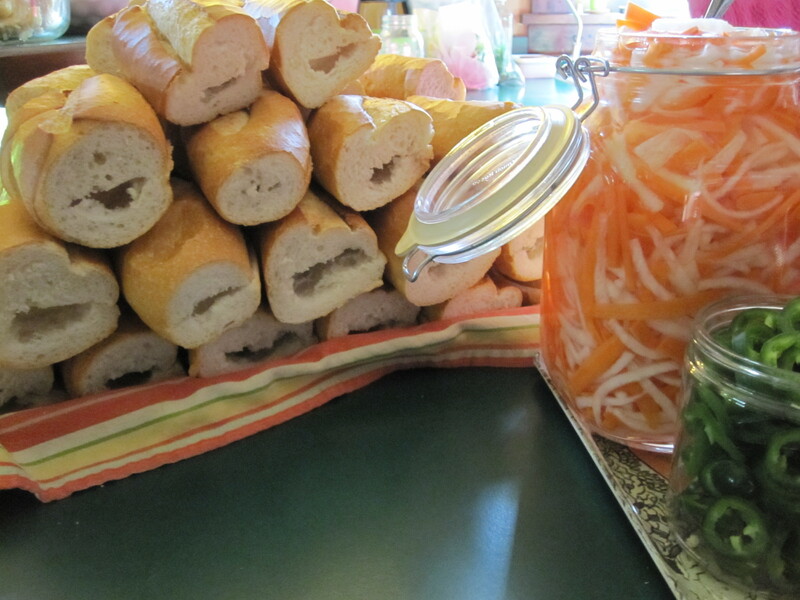 It was pictures of the ingredients I made for homemade banh mi for a party I threw last year. 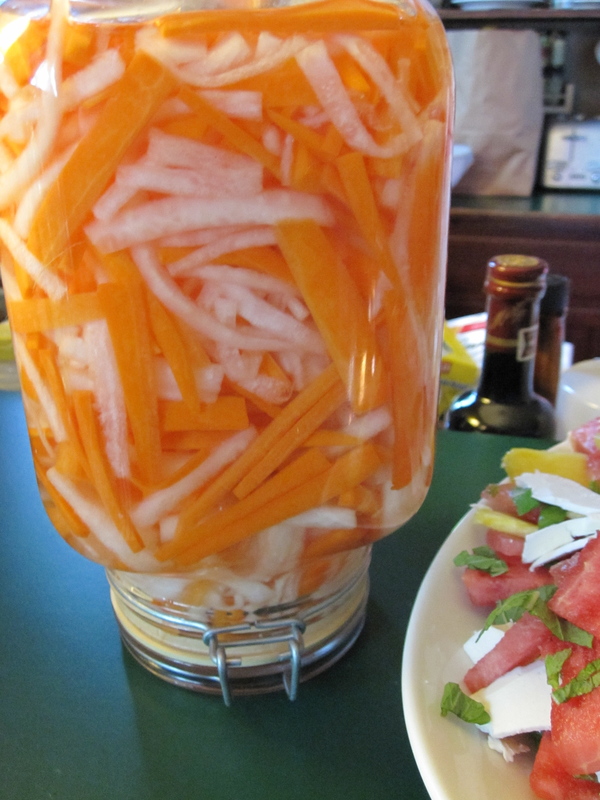 Bright, snappy, and sweet pickled carrots and daikon radish, which I fell for and gladly ate for weeks after serving them to my friends. I still don’t know why he sent these to me. Maybe my review brought up some good memories, a bit of a Proustian moment among the madeleines, a memory of pain perdu. Here’s the baguettes Angela insisted we pick up from Jasmine Deli. Someone in the owner’s family (was it a brother or a cousin?) makes them fresh on a daily basis, and when they’re gone, they’re gone. A couple days later, shopping for food at Midtown Global Market, I spotted this sign. 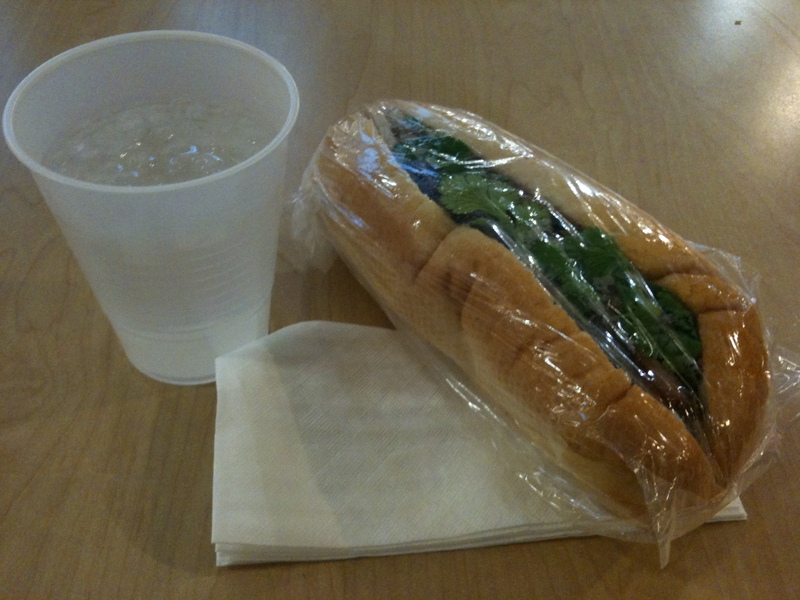 I had no intention of eating anything, but I had to stop and finally order a banh mi. This charming sign is perched on the counter at Pham’s Deli, a bright spot in the middle of the market near the central tables. Pham’s beckons you in with cheerful signs and a tidy operation. There’s quite a few workers back there, although it’s this guy at the rice cooker who seems to run the show. I wonder if it’s Trung Pham, owner of this family-run operation. Check out their adorable website. “Think fresh, think Pham’s.” I like this place. He studiously made my banh mi and, with a swish of his hand, twisted it in a plastic bag and delivered it to me with a smile. All of the needed ingredients came together to make the sandwich every bit as fulfilling as I thought it would be. A mouthful of pickled veggies and bread on the outside, a mouthful of meat and cilantro further in. “This isn’t that spicy,” I thought to myself a moment before I ate a eye-watering jalapeno, seeds and all. The one thing I’m not sold on is the addition of butter (as described in the sign), which has that characteristic slippery feel in your mouth, much unlike mayo, which effortlessly complements the riot of tastes in a banh mi. If it were up to me, the sandwich would be laced with creamy mayo, Sriracha, and boatloads of pickled carrots and daikon. Isn’t it always like that, though? You cater to your idiosyncracies long enough and go changing someone else’s perfectly good thing. The deli serves a few different kinds of banh mi, so I’m eager to get another one the next time I go to the market, one of my favorite spots in the city. This entry was posted in Minneapolis Restaurant Reviews, Things I Make on March 27, 2010 by Carrie. Last week, I had the opportunity to have dinner with Peter Lilienthal, one of the restaurant reviewers for Minneapolis-St Paul magazine. I was introduced to him through a friend given my love of writing about food. Next up on his list of restaurants to review was A25, so Peter graciously asked that I grab two hungry souls and come join him. A25, which opened a few months ago, is the newly reincarnated version of Anemoni, the former sushi outpost of Thom Pham’s Azia Restaurant. A25’s website dares you to imagine yourself stepping off a train and into a back alley of Tokyo, where you are delighted to find a mix of vendors selling delicious street food and wicked infusions. A25 is positioning itself as an edgy, cosmopolitan reprieve within the frenetic city. And I can’t help but say that there’s something pretty darn cute about this — especially in Minneapolis at 6:30 on a Monday night. After all, how much time do we really spend ON the streets? Among the four of us Minneapolines at the table, we had four cars parked outside and spent about 30 seconds on the pavement safely jaywalking our way inside. Our train travels above ground from the city to the mall, stopping traffic on the way, and everyone knows about the missing street food of Minneapolis. Come evening, though, I can see where the street starts to kick in, especially if you are enjoying the oasis of nightlife that corner of the city has to offer. Inside A25’s clever subway-inspired door, ambient paper lanterns hang from the ceiling, corrugated metal surrounds the sushi bar, the exposed brick walls are covered with torn broadsheets and graffiti, and the elevated DJ booth evokes the fire escape of an East Village walk-up. I half expected Mimi to swing down from the balcony in torn fishnet stockings howling about going oooo-ut tonight. Dining with a restaurant critic is an exercise in conviviality. Rather than studying the menu, Peter socratically posed questions to the server to coax out the real scoop on the best stuff to eat. She did a stellar job with everything while Peter alternately asked us what our favorite restaurants are, taking notes when we said something memorable about the food. “This place serves chef-inspired street food,” I said, and Peter wrote it down. “This tastes like pork-flavored bubble gum,” B said of the pork belly, and Peter wrote it down. We had a round of cocktails and two bottles of white wine. The unique calamari tempura fried with cream honey aioli and glazed pecans had a strange hold on me, while the lamb lollipops kept my attention only because of the toasted sweet potatoes they were served on. The unassuming steamed buns were my favorite part of the evening. I think steamed buns are usually enclosed, but these looked like a little sandwich, with the spicy, rich oxtail meat sticking out of the perfect snow white bun. The oxtail was richer and more enjoyable than the pork. Kabocha dumplings with ginger soy tasted typically delicious, while the pork belly was all but a failure. I’m a omnivore who winces at certain cuts of meat, but in the spirit of the thing, I wanted to try pork belly, which seems to make quite a few food lovers rhapsodize. Not at A25. We could barely get our knife through it. I stole some of the accompanying fried egg and spinach and we all left the majority of the plate behind. For sushi, we had BBQ yellow tail, shrimp tempura, and botanebi — that is, B, the daring sushi-eater of the group, had the wide-eyed, whiskered botanebi. Sushi? Delicious. What else can I say. For dessert, we had fried bananas with ginger ice cream, which is too good to fail, and rice pudding with coconut ice cream, which was too bland to succeed. The ice cream was served on top of a bed of dense rice that tasted totally unsweetened. Given how much concept is driving A25, the food has a lot to live up to, and for the most part it does a fantastic job. Street food should be a fix. With A25 as your dealer and so many creative items on the menu, you just have to figure out what you need to order to get yours. This entry was posted in Minneapolis Restaurant Reviews on March 15, 2010 by Carrie. The only banh mi I’ve ever eaten were the ones I made with my own two hands. It’s a little backward to first try this amazing Vietnamese sandwich by making one for myself (and for a few others, too), but it was a darn good approximation. After julienning the daikon and carrot, gently pickling it in a glass jar, sweetening the mayo, marinating the pork and tofu in lemongrass, and picking up the bread from Jasmine Deli, the ingredients and I were close pals and I was able to create more or less the pinnacle of banh mi deliciousness. Ever since then, I’ve been daydreaming about banh mi, about grabbing one from Jasmine Deli after work or finding a good reason to head over to University, but for whatever reason, I never got around to it. When B asked me out on a third date, I got excited when I realized I could suggest Jasmine Deli, a small restaurant on Eat Street known for having one of the best banh mi in town. His new apartment is across the street from the MIA and walking distance to the deli. At last, the banh mi would be mine! B and I, both well-versed in the menu and reviews before we arrived, walked inside the small storefront relieved to see there were plenty of places to sit. It was late and we were hungry. The owner, a friendly guy named Luke who I knew only through their adorably empty facebook page, came by and offered us a seat. Talking a little under his breath, he said, “We’re out of veggie eggrolls and bread” and simply ducked away. Wait. “Did I hear him right?” I said to B, aghast. No bread? I called out after Luke. And with that, my little dream was unceremoniously dashed. No banh mi. I recovered by consoling myself with the fact that there was always pho, so I decided to pick one. The menu listed about 32 kinds of soup, and within the forest of heavily accented Vietnamese, I didn’t see the word “pho” anywhere. “Yes,” he said, eloquently recapping what Luke just told us. Knowing my hopes were dashed again, B kicked in and conquered the menu. “What else?” B said. “I don’t want to disappoint you by ordering something that you aren’t into.” I said I wanted to get the classic Vietnamese combination of beef, cucumber, cilantro, and rice noodle. 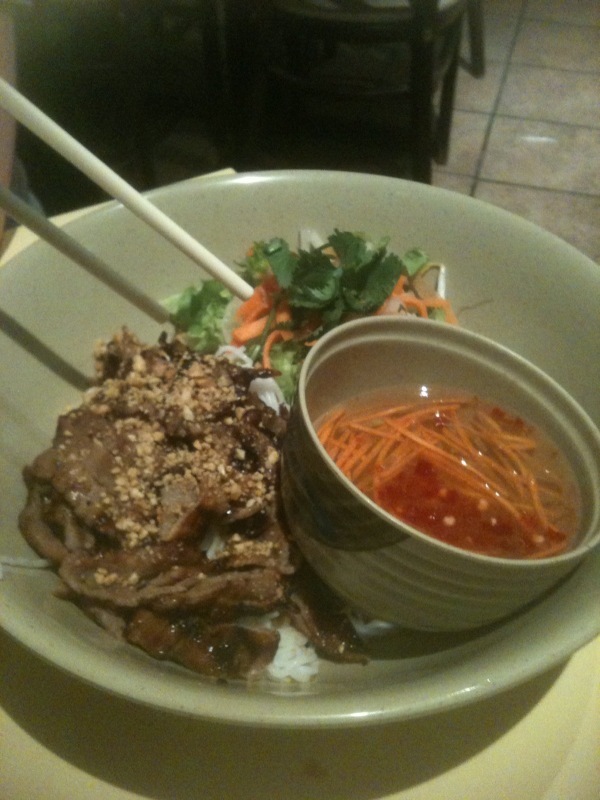 We found it on the menu: vermicelli noodle salad with charbroiled beef. We also decided to get two appetizers, tamarind tofu and crispy pork egg rolls. Dear Luke came back yet again to take our order. I rattled off our choices and asked for bubble tea, which B was excited to see on the menu. “Sorry, I don’t have bubble tea either. . . but you can go to my new cafe,” he said with a charming smile, pointing to the north, knowing at this point he sounded like a salesman. Simultaneously amused and defeated, B and I placed our order and settled in over two glasses of water, satisfied that we divided up the menu the best we could. We loved the sweet tamarind tofu, especially when contrasted with a bite of something spicy. The pork eggrolls were good, but we didn’t see anything special about them. 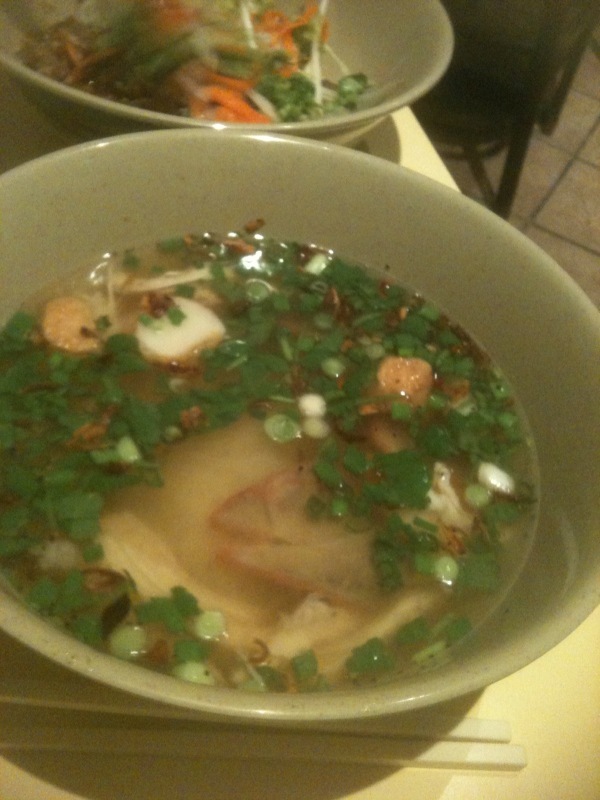 The soup was fulfilling and fresh, but in retrospect, I wouldn’t order it again. Too many proteins for one bowl (or for one girl). The vermicelli noodle salad was the clear winner, with the charbroiled bits of beef playing nicely off the cool noodles and fresh herbs. As B kept grabbing the best bits of charred meat and giving them to me with his chopsticks, I noticed something was wrong. “Must be out of those, too!” he said, at this point probably as amused by the evening as we were. B and I had a laugh together and finished off our meal. “You know what I like about you?” he said, leaning in. “You understand how food is related to everything else in life. You don’t look at it as a separate thing.” And I didn’t realize until later what I great reply that really was. This entry was posted in Minneapolis Restaurant Reviews, Tete a tete (That's French for "dating") on March 8, 2010 by Carrie.